The best research is useless unless a digital strategist synthesizes the findings and turns them into actionable recommendations. Digital Strategy is the roadmap for the effective deployment of your market research. 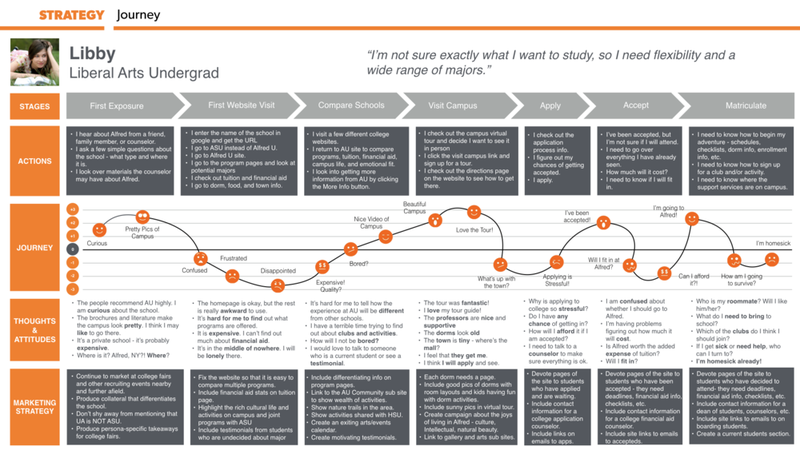 Creating this roadmap is not always easy - it usually requires a great deal of higher-order thinking. But using the approach outlined below, will give you the best tools to turning your findings into a blueprint for the future. Every successful site or app is an example of the successful mediation of an organization's business goals (push) and its target customer's needs (pull.) A good website is the fulcrum of this push/pull. Strategy begins with the effective articulation of the project's business goals. In too many cases I have been asked to "re-do the website so that it's better," or "refresh the application." In both cases, you can't really begin until you know the business reasons for the site or app. Making Money - A site or app usually exists in order to sell a product or service or to capture sales leads. In either case, the end result is the generation of income for the company. Saving Money - Another set of business goals can be attributed to the cost-saving features of website or apps. Deploying effective content on a website or app usually saves calls to the company's call center, saves on sales commissions and economizes on brick and mortar facilities. Expanding Market Penetration / Brand - The third reason for a website or app is to promote the brand digitally. A brand can only be ubiquitous when it has an effective online presence. Business goals must be prioritized and success metrics must be chosen. Prioritization will allow the I.A. to present content in a matter that is the most beneficial to the company. Specific target metrics - example: increasing online sales by 45% in six months - will allow the company to measure success and track return on investment. Customer Segments are built by analyzing trends in site user demographics, psychographics, firmographics and behaviors. One of the goals of market research is to create customer segments that unite around attitudes, preferences and demographics. Creating these customer segments is a bit of an art. The best way is to start by finding trends within the customer base's demographics, psychographics, firmographics and behaviors. Uncovering these trends will allow you to identify key customer segments that think and behave in a similar manner. Finding these segments will make it much easier to target your marketing efforts and help you avoid wasting your marketing dollars. One way to help flesh out your customer segments is to create user Personas. These help personalize your segments and help inspire your marketing efforts. Giving each persona a name and a photo helps humanize your customers. I've often found myself saying things such as "But we can't forget Mathilda!" during client sessions. Personas work. Identifying segments and personas will only get you so far when designing interfaces. 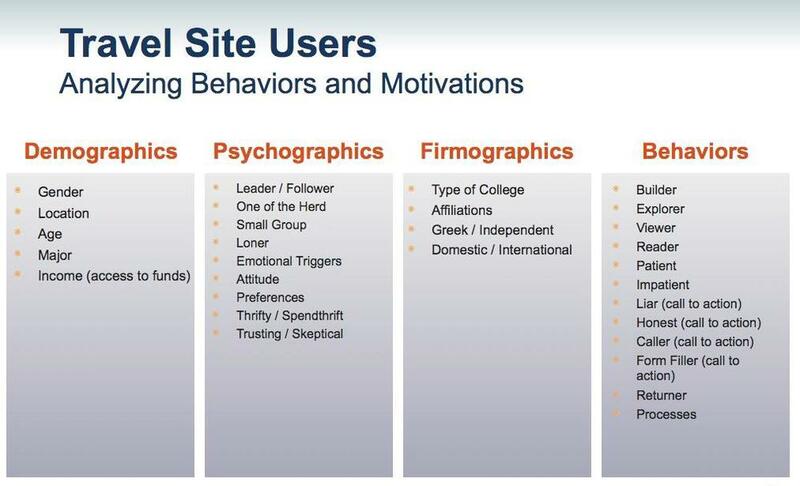 You need to follow these personas into your interfaces by creating user experience flows. Some people call them Use Cases. I call these flows Scenarios or Journey Maps. Example scenario: Rika needs to find a health care provider. She conducts a google search for a physician near her. She sees an ad for a local hospital. She accesses the homepage. She sees the "Find a Physician" tool. She clicks on its. Etc. Understanding each customer segment's needs and their use scenarios will allow you to design a site or app that is truly user centered. 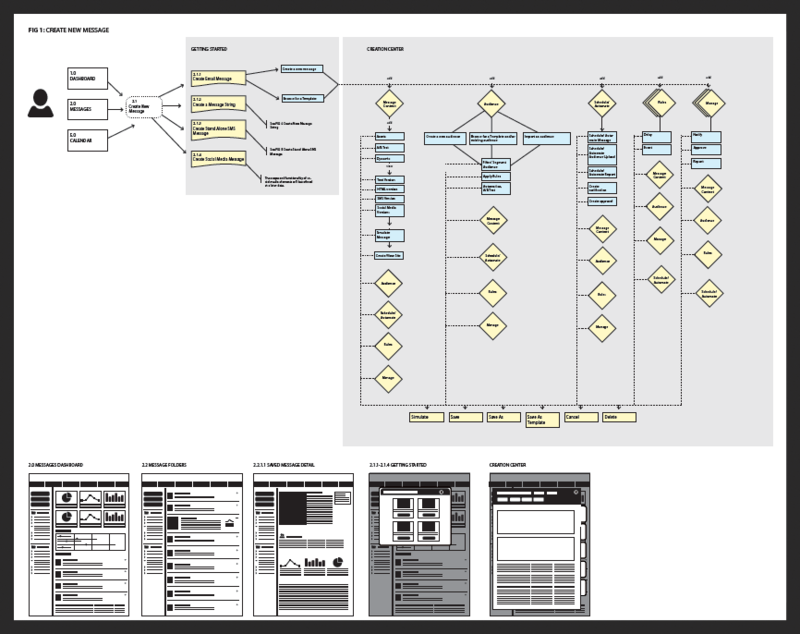 User process flows and scenarios usually take the basic form of the figure above. The next step is to consolidate use cases across all customer types and create a consolidated set of common site tasks. These will need to be prioritized by user importance (as defined by the organization) and by each segments needs priorities. This prioritization of common tasks across the entire site / app will allow the I.A. to organize and present information in a way that is completely in synch with the user's needs and the way users prefer to navigate as they perform tasks. Feature / Function Analysis allows me to take all the findings generated - competitor audit, usability testing, heuristic evaluation - and create recommendations that not only meet customer's needs and fulfill business goals, but that also beat the competition's best-in-breed solutions. This traceability matrix ensures that every recommendation is based on a compelling business need. A technical implications/notes column ensures that the recommendation can be achieved technically. Feature / Function Analysis: the best way of ensuring all recommendations are based on and prioritized by business goals and user needs. Whether these strategy recommendations are presented as a document or Keynote presentation or both, I have found that it's important that the client team experiences it as a group. Before the I.A. phase begins, you have to make sure everyone is heading in the same direction.